Best wishes for a happy, peaceful Christmas and holiday season from the Cemetech staff to all of you and your family and friends! No matter what you celebrate (or don't), we hope you're able to take the end of the year to share some time with those who matter, reflect on the past year, and look forward to what's ahead. We particularly hope that even if you haven't had a chance to pick up your calculator or computer for a while to do some programming, that you take the opportunity to code up a project this winter. 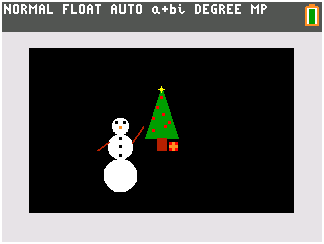 If you need a little inspiration and Christmas cheer, here's a simple TI-BASIC program for the TI-84 Plus CE and TI-84 Plus C Silver Edition that will draw some Christmas greetings on your graphscreen. Just press [ENTER] after it pauses to end the program (and restore your graphscreen settings). If you're curious how it works, just look below, where we've challenged our members to provide the most accurate and concise explanation (yes, guys, that means you. Go to it!). If you want to load this onto your own calculator, you can copy this code into our SourceCoder 3 TI-BASIC editor. Happy holidays! This stores the graph screen to the graph database 0. Then turns the Fn's and axis off. Lastly, the lower bound for the x-axis is set to 0 and the lower y-axis bound is set to around 164. Preps the delta printer then clears the drawing board. This prints the tree with pixels. This prints the tree trunk with more pixels. This prints random little pixel lights onto the tree. Here we have a comment that tells us this will print "MERRY CHRISTMAS" but it also does a thing where this string is saved in the variable "Ans." Pretty schwifty if you ask me. In the For( loop it prints the the string saved in Ans as alternating colors of green and red. Pauses the program until you press enter, When you do that, recalls the graph database 0. Then it needs to get the last word in before it quits. Instead, I'm going to shamelessly post a simpler project of mine from about exactly one year ago. I think I can explain this one easier. ://Change this to change the color of the ornaments and present. ://Store the current graphscreen settings, it's "rude" to just delete them. ://Set up graphscreen by removing the axes and grid and turning off the functions and plots. ://Draw the tree. Note that a filled triangle (We'll call it triangle ABC) can be created by drawing the lines connecting point A to each point on line BC. ://Draw the snowman. If you draw a bunch of concentric circles close enough, then the circle will appear filled. I edited the screenshot a little, there were minor errors where the circles weren't close enough, but it's barely noticable on-calc. ://Draw the present. I edited the screenshot a little, there were minor errors where the present didn't come out correctly, but at least the math is correct. ://Wait for the user to press enter, then restore the current settings. This program is much simpler, in my humble opinion, and I added in-line comments to help explain the code. 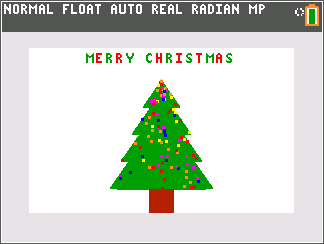 This is even a bit customizable, you can change the color on the second line to change the color of the presents. and the lower y-axis bound is set to around 164. The tilde (~) in SC3 syntax does not mean around, instead, it means the little negative sign thingie. It sets Xmax to 264 and Ymax to 164, so that the visual distance between, say 4 and 5 on the X axis is the same as the visual distance between, say, 10 and 11 on the Y axis. In addition to those four window variables, there are two other window variables that you can use to set the window dimensions. ΔX is the difference between Xmin and Xmax divided by the graphscreen width and ΔY is the difference between Ymin and Ymax divided by the graphscreen height. When you set Xmin and Ymin to 0, you just need to set ΔX and ΔY to 1 to make Xmax 94 264 on the color calculators and Ymin 62 164 on the color calculators. That was all mostly tongue in cheek since I don't really know TI-BASIC anymore, but I appreciate the insightful lesson. Mostly about in regards to the Delta stuff. Much appreciated! Basically in the end, the top left pixel is coord (0,0), and adding 1 to a coord will move you 1 pixel. This equation surely doesn't result in a "MERRY CHRISTMAS" message. Not bad, not bad at all. Although I might try to make it work out as me^rry + x-mas. What does it mean to type it into the console? When you inspect a web pages source code (via right clicking, "Inspect Element") there's a little window that appears in that web pages window/tab. It shows you the source code as well as various tabs for any resources the page calls on, a timeline of events so you can see how long each file takes to load, etc etc. Some browsers may have different names for tabs. But I've always seen the "console" tab named "console." It's an incredibly useful tool. Merry Chrismas and a happy new year !!! There are 240 users online: 13 members and 227 guests. Members: beckadamtheinventor, cwt1078, detron, kbowm2, ProgrammerNerd, realdonutking123, rfdave, Unicorn, _iPhoenix_. © Copyright 2000-2019 Cemetech & Christopher Mitchell :: Page Execution Time: 0.167946 seconds.